The Tonelab EX was the final generation Tonelab. Released in 2011, it offered more digital effects and programs than the four Tonelab models that preceded it. 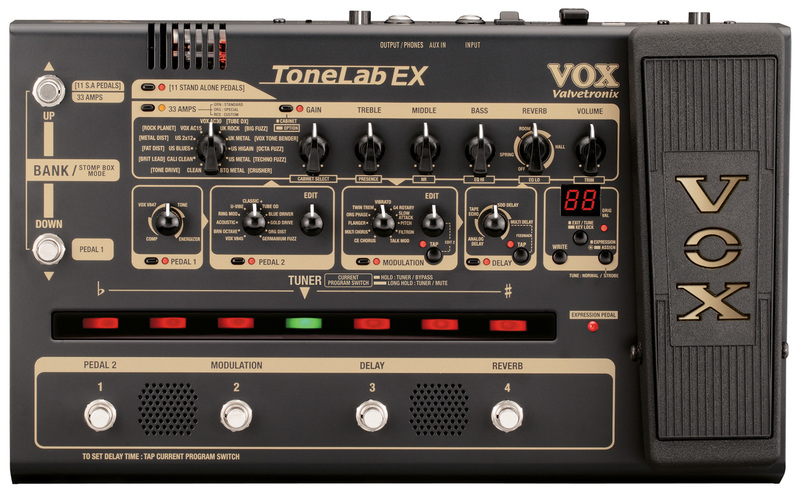 The Tonelab ST and EX were replaced by the Vox Stomplab series in 2012. Amp Models (11 types x 3): Clean, Cali Clean, US Blues, US 2x12, Vox AC-15, Vox AC-30, UK Rock, UK Metal, US Higain, US Metal and BTQ Metal. Each amp model offers three variations: Standard (Green LED), Special (Orange LED) and Custom (Red LED). Dimensions and Weight: ~15.5" x ~9.4" x ~3.23" ~6.6 pounds.